Larson Electronics has announced the release of a single phase 24” explosion-proof exhaust fan for use in flammable environments. This one horsepower unit is equipped with a built-in bird screen capable of achieving 7,820 cubic feet per minute and operates on single-phase 115-230V AC. The EPF-RME-24-1HP explosion proof exhaust fan is rated for use in Class I, Divisions 1 and 2, Group D; and Class II, Divisions 1 and 2, Groups F and G hazardous locations. This single-phase ventilation fan has a 1-HP enclosed motor that can spin at a propeller rate of 1,750 rotations per minute. This fan is made of non-sparking and spun aluminum. Larson Electronics’ explosion proof ventilation fan is multi-voltage and can operate on voltages ranging from 115V to 230V AC. 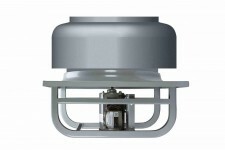 This fan is hard-wired and can be mounted on ceilings or roofings during installation. Suitable applications include use in hazardous locations, clean rooms, oil refineries, chemical plants, and more.